First and foremost, learn the shortcuts. I have heard several people say that they don’t have a head for shortcuts, but the simplest way to speed up post-production workflow is to learn few of the keyboard shortcuts. Start small by remembering and using one shortcut a day and soon you will find that you know more than a dozen. Below is a list of what I consider the most useful and most used keyboard shortcuts. There are dozens more, but these are what I consider the the most critical (clicking on the image will expand the full size image which can be saved and printed). 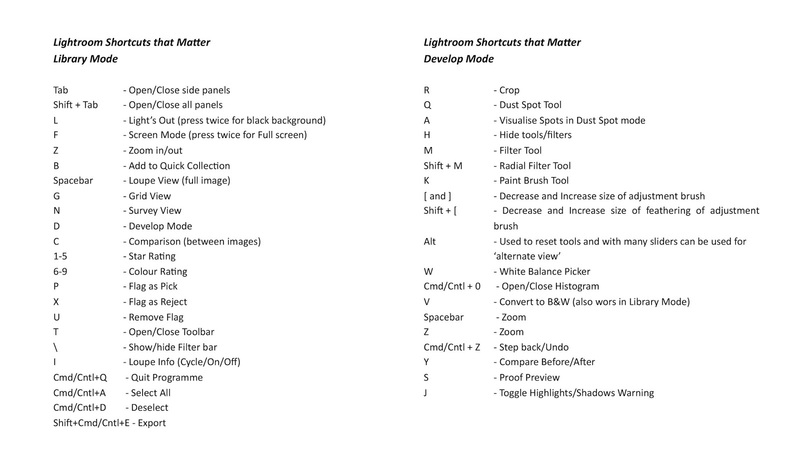 The full list of shortcut keys can be found on the Adobe Photoshop Lightroom Help page. Sadly, unlike Photoshop, Lightroom doesn’t offer customisable key options. In Photoshop you can change the shortcut that is linked to a particular key or sequence of keystrokes. 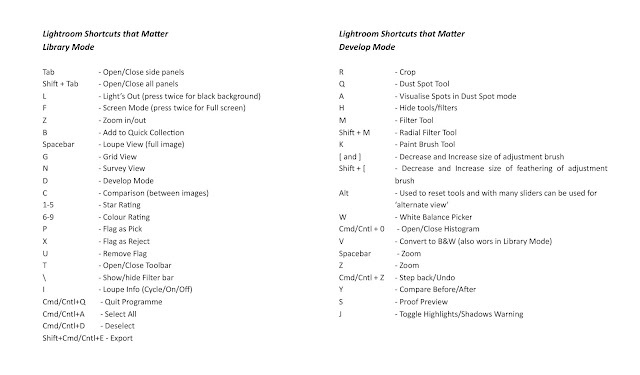 This is useful for some, but again, I personally just prefer learning the actual shortcut in Photoshop. Another solution for many is to invest in a drawing tablet like the Wacom Intuous Pro or Intuous Pen and Touch. The Pro model has customisable buttons and a dial that can be set up as shortcuts in both Lightroom and Photoshop. I personally use an Intuous Pro Medium in front of my iMac and an old Bamboo Medium tablet (which was generously donated by a friend who couldn’t get his head round using a tablet) for my Macbook when I am travelling. I find that they have dramatically sped up my editing workflow and that I never touch the mouse anymore. You can actually copy and paste the settings of one image across to another. This is the first step in learning how to edit multiple images quickly. 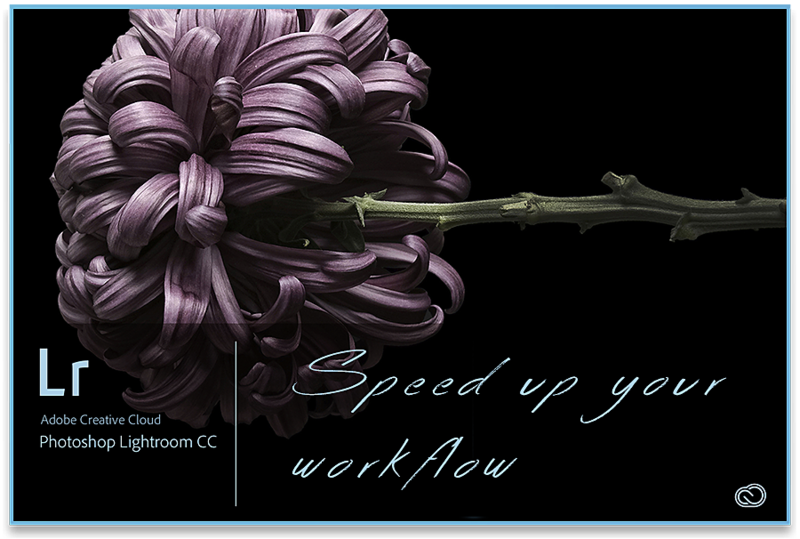 To do this, edit one image and then while still in the Develop mode hit Shift+Cmd+C/Shift+Cntl+C (Mac/Windows). A pop-up window appears with all of the editing parameters that are available in the Develop Panel. There are tick boxes next to each of these, so you can select which edits to copy. Or, alternatively just copy everything. You can then select a different image in the filmstrip and hit Shift+Cmd+V/Shift+Cntl+V to paste the settings. The pop-up window that appears when you hit Shift+Cmd+C. The same window appears for several syncing actions. One particularly useful thing about copying and pasting is that you can also copy the dust-spotting from one image and apply it to a different image. This can save an immense amount of time if you have a particularly dirty sensor. Similar to copy and paste is the ‘Sync’ button in the Develop Module and the ‘Sync Settings’ button on the Library Module. This is a quick way to essentially copy and paste edits across a selection of images. To sync edit settings select the first image that has edits in it already and then, while holding Cmd to individually select additional images or Shift to select images in a row, select the other images that require the same edits. Once all of the have been highlighted, hit the ‘Sync’ button at the bottom of the Develop Panel. The same pop-up window appears as when you copy and paste settings. Once you hit ‘Synchronise’ it essentially copies the edits from the first image that you selected and applies them to all the other highlighted or selected images. A word of warning though. Weirdly if you try and sync a large amount of images - such as when you are editing images for a time-lapse production, the dust-spotter behaves strangely. To make sure that the dust-spotter picks the same spot each time for every individual dust-spot, manually set the source area for each dust-spot. If you allow Lightroom to automatically set the source area, after several frames the actual source suddenly is the same for the majority of cleaned dust-spots i.e. one source area for every dust-spot; which can result in strange objects floating about in the sky if the original source is in the foreground rather than adjacent the actual dust-spot). If you really don’t have time to even play with selections, you can also use the ‘Previous’ button. The default buttons at the bottom of the right hand Develop panel in the Develop module are ‘Previous’ and ‘Reset’. The ‘Previous’ button basically applies all of the previous develop settings that you used. So, if you were working on an image and jump to a different one, hitting the ‘Previous’ button will apply ALL of the changes from the previous image. Since this is all about speeding up workflow, there is even a shortcut key for the ‘Previous’ button. If you hit Cmd+Alt+V you will apply all the edits from the previously selected image. Interestingly, Lightroom Mobile also has a ‘Previous’ button, but one which allows you to either use only the Basic Tones, or everything. 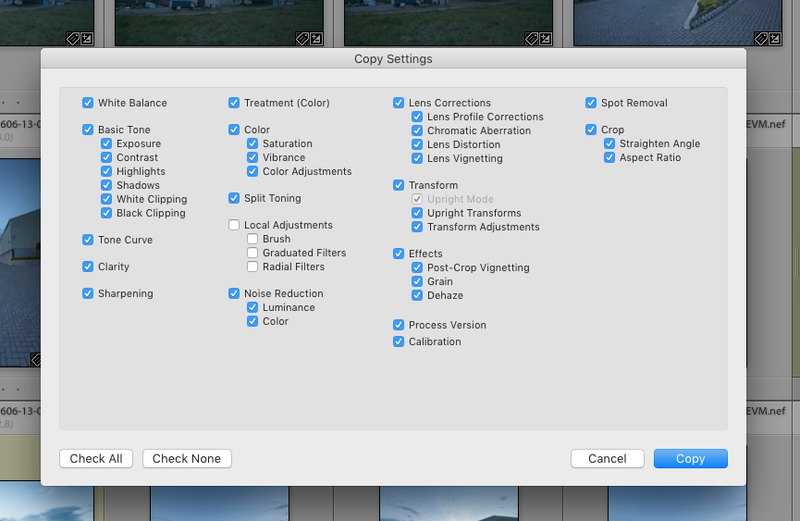 I haven’t been able to figure out whether the full desktop Lightroom has this feature yet or not. 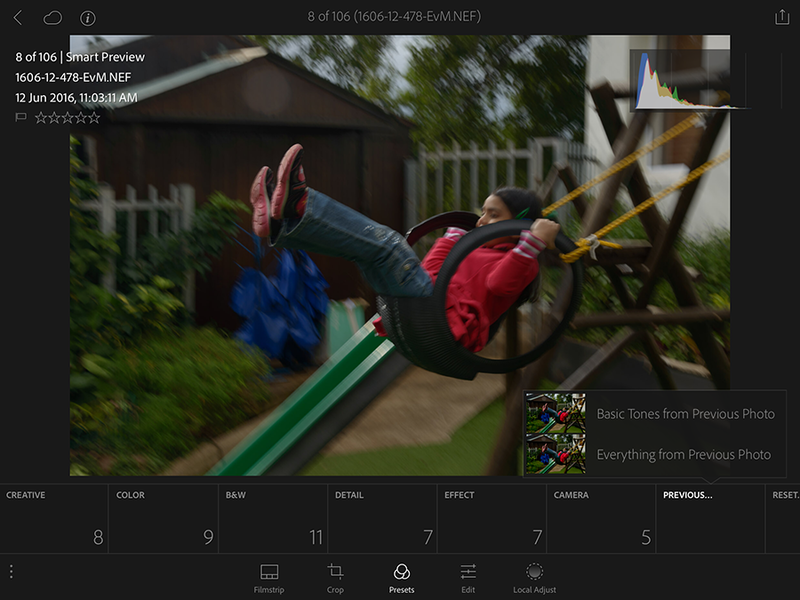 Finally, there’s the Presets panel in both the Develop and Library modules of Lightroom. If you find that you always use similar edits to images, you can start building your own library of presets. As a matter of course I have a preset which sets the image calibration back to camera neutral in an attempt to get the image in Lightroom as similar to that on the back of my LCD screen on the camera as possible. This usually gets applied to images on import, meaning that the first step of my post-production workflow is automatically completed, further saving me time. 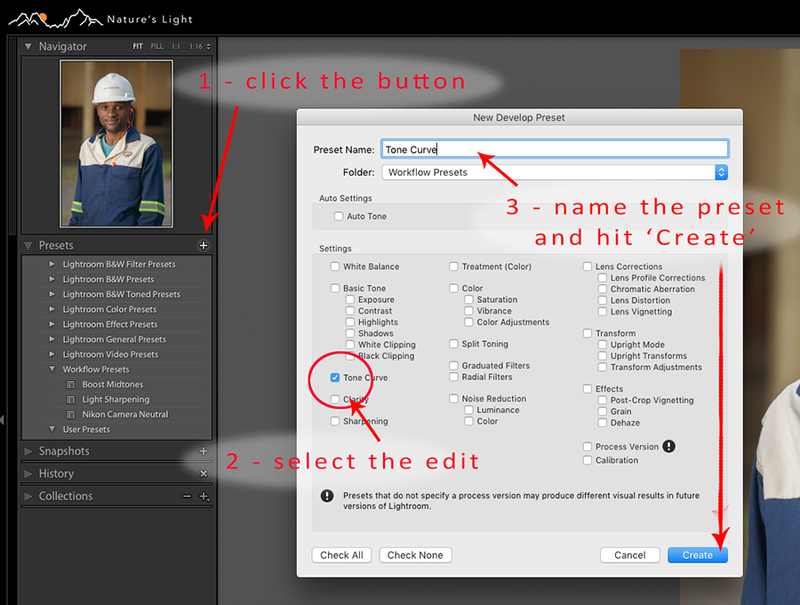 To create a preset first edit an image so as to create the editing parameter. Then click on the plus sign at the top right hand corner of the preset panel (left hand side panel in the Develop Module). The same pop-up window as with the Copy and Paste appears. 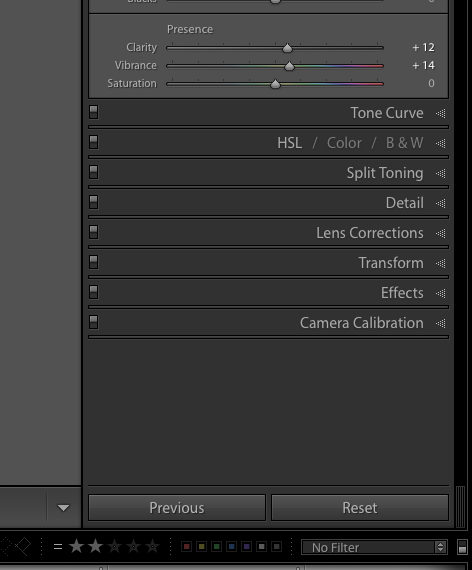 You can select the edit that you want to create the preset for, and then give the preset a name. By default this preset will go to the User Presets dropdown list, however you can also make your own dropdown lists or folders as seen in this example. 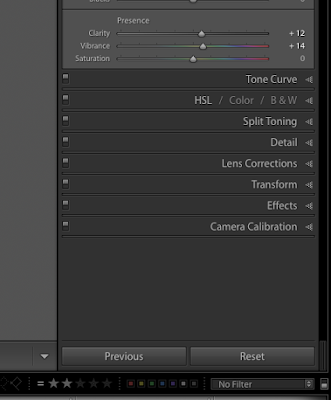 I personally prefer having a range of presets, rather than one that can be applied in one go to an image. I apply presets gradually, building the image from the base as some images will require particular edits while others will not.For instance, you might find having a selection of Sharpening settings can be useful, or a range of noise reduction presets. Lightroom has never been my favourite programme in terms of extracting absolute image quality from an image. However, it is virtually unsurpassed when it comes to getting through a lot of images quickly. The suggestions above will make that process even easier and faster. Despite my dabbling in various other apps like Capture One Pro, I keep coming back to Lightroom because it makes bulk editing extraordinarily easy and fast.